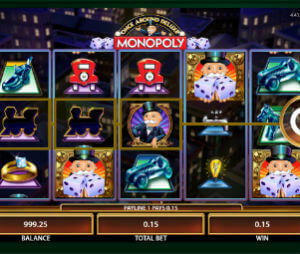 Giant’s Gold is another WMS-powered slot machine using Colossal Reels. It is played at two reel sets, the main featuring a 5×4 layout with 20 paylines and the Colossal Reels set featuring a 5×12 grid with 80 paylines. 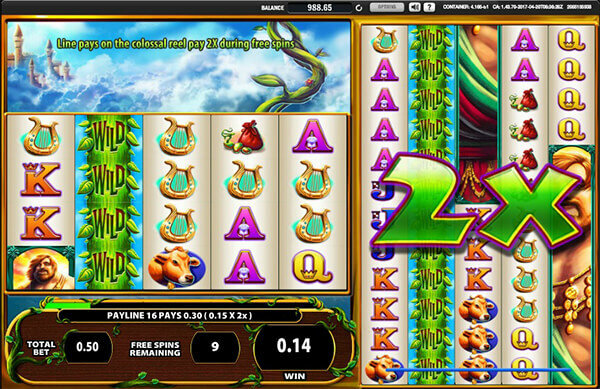 Online since December 2013, the slot based on the fairytale of Jack and the Beanstalk, benefits from cloning Stacked Wilds and up to 100 free spins with paylines on the Colossal Reels set paying doubled awards.The maximum possible win in the Giants Gold slot machine stands at 50,000 coins when playing it at all paylines active. It is obvious that this WMS title is based on the fairytale Jack and the Beanstalks. Yet instead of Jack, you will meet a beautiful lady climbing the magic beanstalk on the reels. Another high value symbol is the Giant himself and these two can show up on the reels in stacks to cover them entirely. Cows, ducks, harps and bags with golden eggs deliver mid-value awards while the rest of positions are covered by generic playing card symbols. The graphics are nicely drawn in bright colours with colourful symbols landing on plain white reels set against idyllic village scenery. Farm sounds play in the background during the base game while during the free spins feature you will hear the rock version of the Fee-fi-fo-fum song played by the Giant. The beanstalk stands for Wild that can appear in stacks to cover the reels entirely. It will help you form more winning combinations by replacing all regular symbols. Whenever a full stack of Wilds cover any of the reels on the main reel set, it will be transferred to the corresponding Colossal Reel and fill it entirely. In a similar was as on other titles of the series, such as Rainbow Riches, Zeus 1000 and Spartacus slots. The Feature or Scatter symbol is represented by the golden egg and it shows up only on the reels 1, 3 and 5 of both reel sets. Land 3 or more Scatters across 3 or more reels on both reel sets and you will trigger the free spin feature. Each additional Scatter awards an additional free spin with 40 Scatters awarding a maximum of 100 free spins. During free games, paylines on the Colossal Reel set pay doubled prizes. Stacked Wilds will be cloned to Colossal Reels during free spins, just like within the base game. We have already mentioned that Wild creates winning combinations in its own right and this is the most lucrative symbol in the Giants Gold slot awarding 500 coins for a five of a kind combination. Other two valuable symbols are the lady and Giant himself delivering 250 and 200 coins for five symbols of a kind landed on an active payline. Needless to say, you will have the best odds of winning when all paylines are active, so instead of turning them off, make sure to adjust the bet to your budget. It can be anywhere between $0.50 and $100 per spin, which is a wide betting range that will please all kinds of players, maybe besides penny slots fans. The game brags an above average RTP of 96.21%, which makes it worth playing. It’s of course still below what some of the best online slots have to offer, but still very solid.